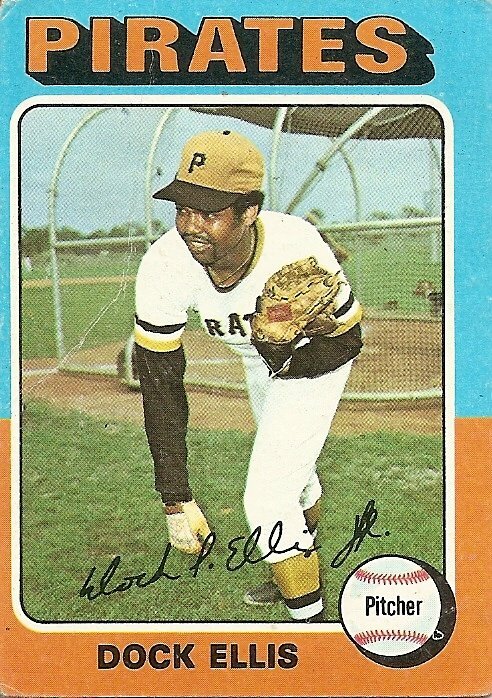 Sign Our Petition to Have MLB Air the Dock Ellis No-Hitter! It is time for me to put my money where my mouth is — metaphorically that is, I’m not going to eat money, that’s far too extravagant for me — the Slanch Report has started an online petition asking the MLB Network to air the Dock Ellis no-hitter he threw on June 12, 1970 against the San Diego Padres. The moment was a seminal piece of baseball history and is certainly as worthy of being rerun as the Mark Fidrych games the network showed earlier this year just before Fidrych’s unfortunate death. Please PLEASE PLEASE join us in this cause and sign the petition below so we can all share in this special and fantastic moment of baseball history. THANKS! I received an email from the folks over at MLB Network, our petition WORKED — well, in that it attracted their attention — unfortunately, they’ve searched their archives and MLB does NOT have any footage of the game. Or at least that’s what they claim. I did ask for them to air the Dock Ellis game where he tried to bean all the Cincinnati Reds and was thrown out after the 5th batter instead. They haven’t gotten back to me on that one. So, MLB may not have footage but there has to be SOME SOMEWHERE right? Spread the word, check your attics, we MUST find this footage. And to everyone who signed or passed along this petition, all 1200+(!) of you, I am most most most incredibly thankful. You’re all heroes in my book. I was #7. SIGN IT PLEASE EVERYBODY!!! I’m behind you, slanchreport! EXCELLENT IDEA!! slanch, keep this at the top of the page for a week. we need to get some signatures on this thing! you’ll see in fact that he DID take acid that morning and that he also took some amphetamines before the game began which presumably helped him concentrate and focus just enough. While it was a no-hitter it certainly wasn’t perfect, Ellis walked a bunch of guys, threw some wild pitches, hit batters, but he did it all tripping and sans hits. I’m not sure an animated cartoon would hold up as factual evidence. Dock did claim repeatedly (since 1984) that he was on LSD when he threw that no-hitter. Outside of his claims, there appears to be no further evidence. He did tell his biographer Hall in 1976 (for the first edition of the biography) that he was on LSD, which certainly lends more credence. This was outlined in the revisions to the 2d ed. of _In the Country of Baseball_. Even paying attention to the more full interview, you’ll note that he said that he dropped acid before leaving for LA from SD. He said he then dropped more in the morning of the day of the game. What time in the morning? He probably had no idea. He was at the tail end of a multi-day trip, and bolstered with “greenies” by the time he got to the mound (game time 2:13pm). He certainly did not dose just prior to the game. I seriously doubt there is any television footage of the game. I have researched extensively, and the best there appears to be is a home movie from the stands. It’s not even clear the game was televised. Keep in mind this was the opening game of a double-header, and the attendance was tiny. Well, considering that LSD’s affects last for upwards of 8-12 hours, I’d think it’s pretty safe to say that Dock was still tripping balls when he was on the mound. Regardless, HE insists he was tripping, and really why would he lie about that? I’m very concerned that there isn’t any footage of the game, but just in case, we should all be pushing MLB to FIND SOME at the least. I wanna see what happens! If we can’t see this game, I’d at least like to see the May 1, 1974 game when he tried to hit the entire Cincinnati lineup. There is no way in hell they would air that? How stupid van you people be? This is the U.S. Nothing interesting or ‘counterculture’ is allowed on our airwaves anymore- unless it’s aired under the premise of how “bad” it is. Signer # 1200!!!! It’s go time MLB! Oh man! Great find! WE HAVE TO GET THAT FOOTAGE ON AIR! I’ve already reached out to MLB network with this new piece of information, let’s hope something gets done. That’s the home movie. My best guess is short clip of super-8 from a fan in the stands.